You have been invited to a dinner in a beautiful manor house just outside of town. The year is 1563, and your host is Niclaes Jonghelinck, a successful and influential businessman. As you are shown down the hallway you notice paintings on the wall, depicting seasonal activities in your region. As you stop and talk about deer hunting around Antwerp, you begin to understand one thing: your host is very concerned about the wellbeing of the city and its future. After enjoying the beautiful spread of food that has been put in front of you, your host guides your attention to the wall, where the painting above hangs. By now you should find both your appetite and intellect stimulated. This was the environment Pieter Bruegel the Elder’s The Tower of Babel was painted into to inspire dialogue, a format known as ‘convivium’ (living together/eating together). Masons are working on huge building blocks, as a royal figure enters the scene. Some are giving him worthy attention, others are too busy. There’s a set of tools awaiting the viewer on a stone, ready to be picked up. Are you taking up the artist’s invitation? And if you do, how would you react to the ruler and his project? On the right side of the painting we see a large port, busy ships, boats and rafts. We can follow the building material up through the vast structure. On the way we get a sense not just of the size of the construction, but also of the time span: little houses have been built on the pathway of the building to sustain the workers as they climb higher. Food is being cooked and laundry is drying in the archways. The tower has become a city in itself. As we revisit the Babel story, we may notice that there is no mention of a king. We can of course assume that this is King Nimrod of Babylon. But is the city painted in a Middle-East setting? The surrounding city and the landscape clearly suggest Northern Europe. But if the city is Antwerp, then who is this king? And what is this tower doing in the middle of everything? Is it real? Or is it a – biblically potent – metaphor for things that are going on in 1563? Antwerp was the fastest growing, most diverse business center of Northern Europe. Located next to the sea, on the cross lines between the Protestant and the Catholic world, the city was the New York of its time. Yet the city struggled with the tension between various interest groups, a situation the Spanish ruler king Philip was not slow to utilize to his political and religious advantage. The tower is impressive. Its sheer size is indeed an expression of human ingenuity. Also, the building seems to have a life of its own. Even the colors are suggesting an organism. But notice the angle of the arches. They seem slightly tipping, following the line of ascent rather than a correct engineered vertical. Notice the water at the foundation by the gate. If you’ve ever experienced water damage in your living quarters, you get the idea. In spite of all its magnificent splendor the project is flawed in its very design. The project, however grandiose, will eventually collapse into the soft Netherlandish soil. As history would show, Bruegel was not far off the mark. Violence and civil war soon followed. In the biblical narrative the Babylonians want to make a name for themselves “so that they won’t be scattered.” Were they afraid of being ‘sent out’ to the world? After Noah this was what God invited them to do. Clearly they are disobedient, but that’s less the point. They not only prefer the safety and comfort of their presumably successful culture, they also want to shout it from the top of their tower. Is there anything wrong with building a vertical city? Contrary to common belief the Bible promotes cities and city-life, from Cain onwards. The new heaven and the new earth will be a garden city. Contrary to theology that claims cities are inherently bad – ironically influenced by Rousseau – the Bible suggests a different story. Cities might be complex, places of the best and the worst, but not a problem in and of themselves. “And should I not have concern for the great city of Nineveh?” (Jonah 4:11). God reacts, but not with total judgement as with the flood. He comes down to the Babylonian tower (notice the humor), carefully evaluating the situation below. He then dissolves the common bond, language itself. By doing so he reaches his original goal: sending his people out. The convivium discussions could likely have touched on these angles. Sitting at that table, what would have been your reaction? Are you working for Nimrod or the Kingdom? As the Old-Testament story is retold, re-visualized and relived, the warning is reissued. 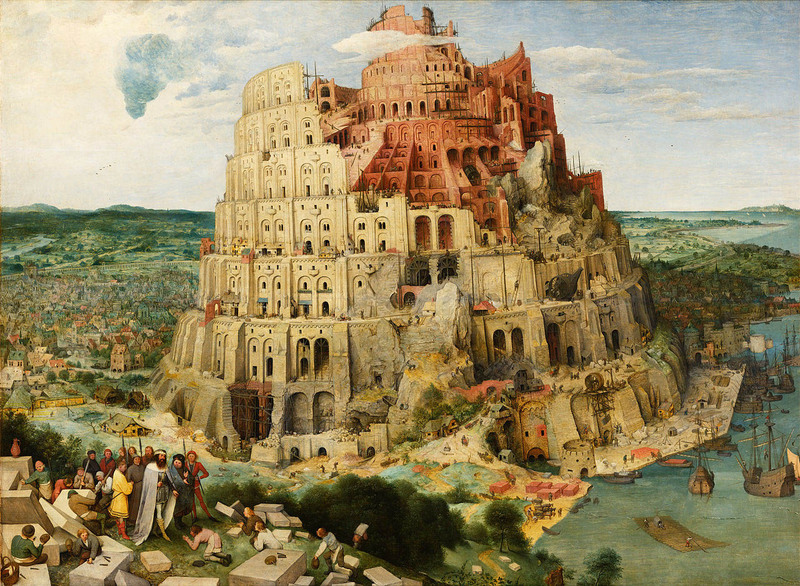 Pieter Bruegel the Elder: The Tower of Babel, Vienna version, 1563, oil on panel. 114 x 155 cm. Pieter Bruegel the Elder (1525 – 1569) was a remarkable Netherlandish painter, who pioneered bringing ordinary life into visual imagery. His influence on Northern-European art is hard to ignore. Per-Ole Lind works at the L'Abri Fellowship in Huémoz, Switzerland, focusing mainly on creativity in relation to the gospel. He has a background in art direction and graphic design. Sources: Barbara A. Kaminska, Journal of Historians of Netherlandish Art Volume 6, Issue 2 (Summer 2014); Timothy Keller: A Tale of Two Cities, Sermon February 1, 2009.